Not that I always hurry. Patience is a virtue and it’s often a theraputic pleasure to wait and watch the yachts sailing in and out of the harbour. The bridge is more that a road across the harbour. It’s a frontier between two different historic town: Weymouth on the south and Melcombe Regis on the north. This subtlety is lost of most tourists, but then, apparently some regular visitors don’t even know the bridge exists! Their knowledge of Weymouth (actually, Melcombe Regis) stops where the beach meets the Pavilion theatre. Today’s Town Bridge is an old lady of 85. Opened in 1930, it’s the latest in a series of structures on or near this spot since around 1597. They’ve all the some form of lifting capability to allow vessels to enter the inner harbour. Click here to see a bridge lift at high speed [Facebook video]. 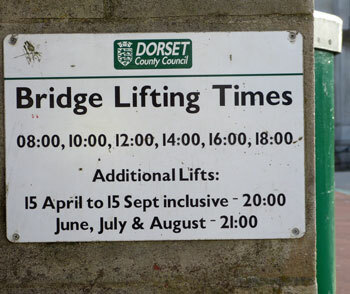 History records rivalry between the two towns of Weymouth and Melcombe Regis, which were connected by a ferry until the first bridge was constructed. It’s not unrealistic to suppose that many inhabitants of one town rarely, if ever, crossed to the other side, and this ignorance of one another helped breed hostility. Bridge building was both literal and metaphorical in the late 1500s, as the two towns had been formed into a single borough from 1571. It was still another 26 years before the physical connection was put in place. In 1645 the Town Bridge become, briefly, an armed frontier during England’s Civil War. Solider loyal to the King occupied Weymouth while troops controlled by Parliament defended Melcombe Regis. For a while the Royalists seemed to have the upper hand but on a February day the Roundheads lowered the bridge and stormed across to capture strongpoints in Weymouth. 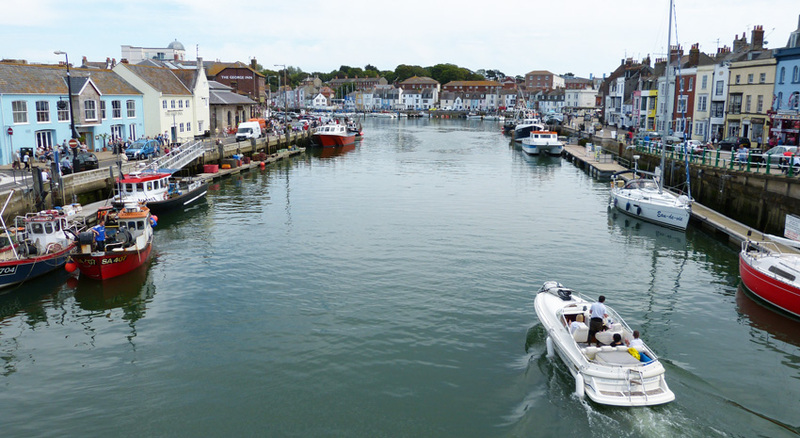 In the early 1800s, when King George III often visited Weymouth and Britain was at war with France, local soldiers were concerned that the bridge could again become part of the town’s defences, should the French attempt to invade. The military were particularly worried because the poor condition of the bridge, built in 1770, meant it could not be raised in a hurry. They asked the borough council to repair but were told no funds were available. That dilapidated bridge was replaced in 1824 by the first crossing constructed of stone. This was in turn demolished in the 1920s, to make way for today’s bridge. At 85 it’s already older than some of the bridges that came before. It’s not unreasonable to ask how much longer will it last?